The massive complex at FICO Eataly World is filled with dozens of food stands, restaurants, and areas dedicated to farming, livestock, educational workshops, and cooking classes. Entrance is free, you pay only for what you consume or courses you take part in. There are 40 production sites, representing everything from gelato, honey, cured meat and chocolate to vino, artisan beer, and cheese. 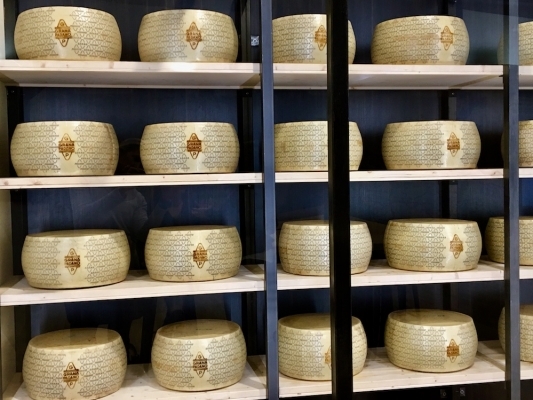 Visitors can learn how to make pasta by hand, see mortadella made before their eyes, and watch the process of making massive rounds of Grano Padano cheese. The FICO philosophy is educational at its core, aimed at informing visitors about how Italian products are made. There are several ‘food production chains,’ in which visitors can literally see how the ‘farm to table’ process works. In the case of Grano Padano cheese, for example, there is actual livestock outside from which the milk is taken, and inside giant baths of salt brine where the wheels are soaked for 15-30 days. The FICO complex is also dedicated to sustainability. The massive solar panels on the roof produce 80% of the energy used in the park. In order to take full advantage of your time, we at the Italian Concierge suggest doing some research ahead of time. With so many expositions, food stands, demonstrations and restaurants to experience, some prep work is necessary in order to make the most of your time. The only problem you’ll likely run into is being too stuffed to fit in another meal. But alas, to work up an appetite visitors can pedal around on free bike rentals, or even reserve a paddle ball or beach volleyball court to make room for the next indulgence. Between bites, there are plenty of educational activities to engage in. The ‘giostre’ or small pavilions offer interactive activities such as planting your own sapling (which you can monitor and follow its growth online), virtually explore the fish species found in the seas of Italy on an interactive map, and test your knowledge with quizzes on various topics including wine, olive oil and sustainable farming. The real beauty is the ability to be able to taste regional specialties from every corner of the country. Start your day with a fresh Sicilian pastry, then sip Lambruso- a sparkling red wine from Emiglia Romana, while enjoying burrata from Puglia, sample some spicy sausage from Calabria, move on to arrosticini- charcoal roasted meat skewers from Abruzzo, or sit down to a lavish meal prepared by a Michelin starred chef. As your day is winding down and you near the exit, not to fret- you can take a piece of FICO home with you. Not only is there a giant grocery story stocked full of specialty products, there is also a Posta- Italian Post Office, that will ship your goodies home for you. Whether you are a professional chef, passionate foodie, or simply looking for an interesting excursion in Bologna, FICO Eataly World will not disappoint.